This, my friends, is a bear. This bear is hungry. This bear is angry. This bear is “hangry.” This bear sometimes waits too long in between meals and then yells at her husband when he offers to make her scrambled eggs. This bear will swear up and down and sideways that she is not hungry. Why does she have to be hungry? Can’t a bear just be emotional? Gosh. Nobody understands a bear. This bear will then complain that her stomach hurts and that she feels nauseous. Husband-bear will suggest again that his wife-bear is simply hungry. This bear will not have it. This bear is convinced that she is probably dying, and the only thing her husband-bear can think about is scrambled eggs. Typical husband-bear. Always thinking about breakfast. Husband-bear will totally just make those scrambled eggs anyway, and place the loaded plate in front of his angry wife-bear’s snarling snout. This bear will devour them. This bear was the hungriest. Confession… this bear is me. This is basically a self portrait. Hanger: it isn’t pretty. We try to avoid these types of situations. This is one of the reasons that I, at any given time, have 2-3 snacks in my purse. This is also the reason why every couple of months I might find the remains of what used to be an apple smashed and brown in the side pocket of my leather pocketbook. Um, I mean, that has never happened. That would make me gross (yeah, it’s happened). This totally doesn’t have a point. I will be straight with you… I kind of just wanted to post a watercolor painting of a bear. I feel pressure to tie in a story. You are waiting for this to make sense. I can feel it. I guess the moral of the story would technically be “YOU AREN’T DYING. JUST EAT THE SCRAMBLED EGGS! !” Also, my husband makes a lot of eggs. His spirit animal is breakfast. If the moral of your story is not solid, would they refer to it as loose morals? So many questions. Let’s cut our losses and look at awesome bites and finds around the inter-web. I haven’t done one of those posts in a while. Want to see what I have been into this week? Cool. Maybe this will give you some meal-time inspiration and stave off the dreaded hanger. 1) This cocktail had me at “Lemon Ginger,” but I’m totally not mad at the “Bourbon Fizz” part either. 2) Oh you know, just Gluten-Free Lemongrass Bars With A Coconut Shortbread Crust. NBD. 3) Did you say PEACH honey mustard? Yes, let’s make these chicken strips gluten-free. 4) My friend Becca actually made her own non-toxic sunscreen from scratch. She’s major. 5) Want to find all of the awesome local farms, markets and artisan food makers in your area? Go HERE. 6) I will totally be grilling up some version of these drumsticks. 7) Look, Guys! Another way I can fit more watermelon in my face! Perfect. 8) This salad makes me drool. I want. 9) Can’t decide where to grab a bite? Spin this Wheel Of Lunch! 10) Don’t want to go out for lunch? Prep these make-ahead salads for your work week! 11) Oh HEY THERE, Vegan Chocolate Chip Cookie Dough Popsicles! You will be mine. 12) Live in San Francisco? Are your friends always just too busy to hang out? Yeah, here is what is REALLY going on. 13) These cats have no idea what to do with their lives. 14) Have you guys met my friend Em over that The Pig and Quill? You should meet. You’ll like her. I want to make this salad of hers pronto. 15) I’ve literally had this song stuck in my head for weeks. WHY?! I am haunted by the ghost of the 90’s. Not awkward at all. Ok… I think we’ve linked the heck out of things. Let’s chill out. I am going to go and check my purse for apples. No, really. Thanks for the reminder. You’re the best. Over and out! 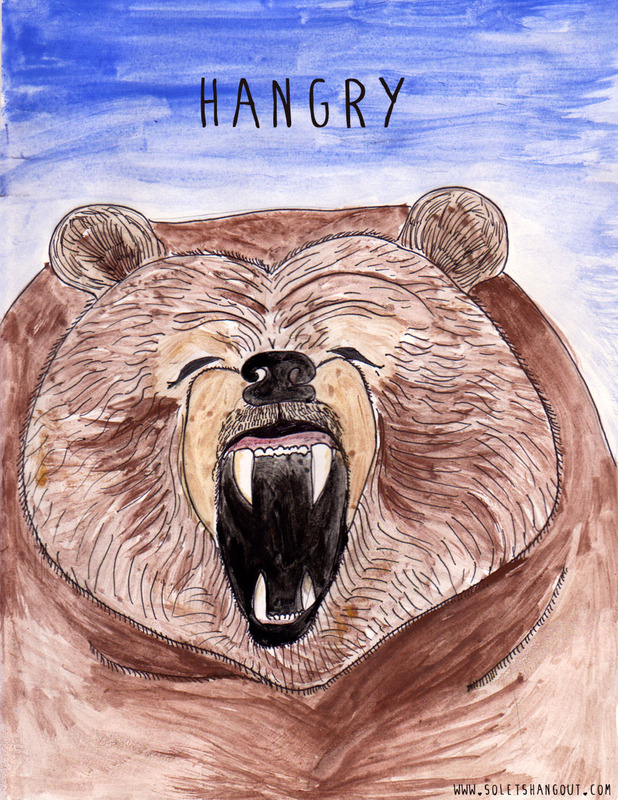 Loving the “Hangry Bear”! I too start to look like this when I am super hungry and my husband also tries to feed me eggs. Maybe that is what all the great hubbies of women like us that turn into hangry bears do. They may even have a support group cause I know I can be brutal when in full bear mode. Thanks for the link back to my bars and the other tasty links! Haha. Let’s start that support group. I will go first. Hello. My name is Gina, and I can be a hangry bear. Real hangry. Also, yes… all your recipes lately. I want them all.